This year, the theme for International Women’s Day on March 8, 2015 was “Make it happen.” Many women have already made it happen in decades gone by. 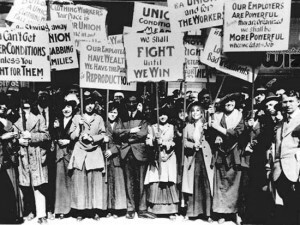 International Women’s Day began in 1911. It was a European thing until it became infectious, migrating to the United States and the world. During that time, women’s rights were a controversial topic in the political arena. For many women’s organizations, the hot topic and priority was winning the vote and woman suffrage. Many women contributed to the cause and are still doing so today. Many men and women have written books to tell of the many contributions that women have made to history. The economic depression in the 1930s put a dim light on the topic and soon the rights of women were no longer as important as World War II and the depression. It wasn’t until during the 50s and 60s when the problem was pointed out by Betty Friedman that many paid attention to the bored and isolated housewife who surrendered her scholarly and professional goals to stay at home raising her children. This wasn’t yet the women’s liberation era, but one that showcased a women’s movement that needed to be revived. However, once this revival took place, many started to see the women’s liberation come to the forefront as the issues of women became an avid discussion. International Women’s Day is a global celebration of the political, economic and social accomplishments of women in the past, present and future. In fact, in some countries, every March 8 is a national holiday. These countries include Russia, China, Bulgaria and Vietnam. The day honors the work of women who didn’t get the chance to vote because of their gender. It also celebrates the success of women in opening doors for other women politically and reminding us of the injustices and discriminations that still need to be addressed. More women want to be in senior leadership roles, but in most cases are overlooked instead to their male colleague. The fight is to ensure that women are recognized for their achievement and work because they are just as qualified and eligible to do the same job that a man can. Today, when given a chance, women are making it happen in their households, communities and workplaces. It is time to celebrate those achievements and fight for greater equality in the nation and the world. Mark your calendar every March 8 for International Women’s Day. Do what it takes to play your part, even if you are not a female. You will make a difference, no matter how small. Let us know what you think about this well-recognized day. Your comments are welcomed below.